ULTIMATE PERFORMANCE DRILLED & GROOVED BRAKE DISCS. FRONT & REAR BRAKE DISCS, & MATCHING BREMBO BRAKE PADS (FULL SET). Response - Feel - Performance - Efficiency. 320d 320i 320i 325i 325xi 328i. Notes: Certain models only - Check compatibility chart for full details ###This is for models with front 300mm discs and 294mm rear discs###. Pictures are for reference sample only - you will receive the correct Discs and Pads for your car. Set of 4 Performance Drilled and Grooved Brake Discs. Accompanied by top quality BREMBO brake pads (Full Set). Great looking brake discs can really help set off a nice set of wheels! Even from a passing glance the brake discs oooze their shear performance. Precision Drilled and Grooved result in a flawless appearance. Each hole is precision drilled and countersunk. The unique countersunk reduce the heat by channeling the hot gas and air into the ventilation hole. (This is not considered on lesser discs that are available). Precision grooving each groove is at a particular curve designed to trap and clear the hot air and gasses. And pull it away from the brake pads. Finished to the highest standards the performance discs will add an immediate boost to any braking performance Rotational direction (see below) designed using studies in centrifugal forces used the rotational pattern in the grooves and holes to combine with the centrifugal force of the turning to improve the cooling even further. With 1 disc being for each side of the car so the rotationial direction is correct. Great looks with approx 7-8 grooves / drill lines in each disc. Ensures even looks on the disc. Remember pictures are for reference only You will receive the correct discs as in the title and application guide above. Drilled holes completely through the disc help extract heat, dust, moisture and gasses away from the braking surface. Precision drilled around the complete radius of the disc these holes also greatly reduce the weight and thus rotational mass from the brake discs. Grooved lines around the radius of the discs also help extract heat, dust, moisture and gasses away from the brake pad surface, while also providing cool air across the breaking surface. Directional discs you will receive one disc for each side (L+R) for each axle. These are compatible with the standard calipers on your car, so a great upgrade and simple to fit and a direct replacement nothing else required. Heat is the biggest enemy of any brakes - especially when driving a car to get the best out of it, should it be on your favourite road or in competition. Our Sport brake discs are designed to get the best performance from all driving situations, and When accompanied by Brembo pads you are guaranteed the best in performance. Less heat Results in less chance of your brake pads glazing (become very smooth and shiny which greatly reduces performance for the remaining life of the pads) Excessive heat is also by far the greatest cause of discs warping. The Chart on the left below shows the bad effects increased heat has on all car brakes. Even when holding a steady force on the brake pedal the heat, dust and gasses quickly builds and starts to greatly affect the brakes, They will start to fade and with more prolonged use, will fail altogether! The chart on the right shows that when using Drilled & Grooved Discs, The temperature level never goes into the higher heat zone as a result you will experience very little or no brake fade even when driving to the cars limits and even with standard brake pads! These Discs are intended as a direct replacement - there is no need to change any other item they will work fine with your standard brake caliper and your standard brake pads. They are suitable for all driving situations from cruising the streets looking good, to high speed, flat out, motorsport! Included in this set is a matching set of Brembo brake pads. One of the best names in the industry these brake pads are amongst the best available, They will provide the best performance while still maintaining long life. Many people make a vital mistake of fitting very high performance brake pads for road driving, but the problem with fitting these pads is that they are designed to work when extremely hot, and you will get very little stopping power until they get to the higher temperatures they require (if ever)! For this reason we supply brake pads suitable for normal to fast road use! We do recommend upgrading to a more performance brake pads and brake fluid ONLY if you are going to use you car in a competition environment. Application is as above and in the title - if in doubt do double check with the dimensions given at the top of this description! ALL ITEMS IN STOCK HERE IN THE. GREAT LOOKS FANTASTIC PERFORMANCE - AND ALL AT A GREAT PRICE! SAY GOODBYE TO YOUR TATTY OLD BRAKE DISCS. Extremely high manufacturing standards - made to exceed all specification of OEM brake discs. Made from only the finest grade "A" materials to ultra fine tolerance standards - these discs will not be matched for quality! Good quality brakes results in shorter / safer braking distances. Remember in competition in order to Go Fast you need to Slow Down Fast! We are dedicated to ensuring the highest possible quality service to our customers. Don't forget to regularly visit our store as we are constantly adding new products, special offers and unbeatable deals to our listings! 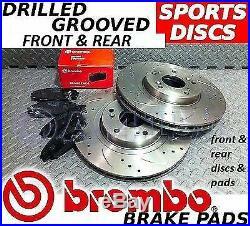 The item "BMW 3 Series E46 325 328 Drilled & Grooved FRONT & REAR Brake Discs BREMBO Pads" is in sale since Friday, July 27, 2012. This item is in the category "Vehicle Parts & Accessories\Car Tuning & Styling\Performance Braking\Other Performance Braking". The seller is "asc_group" and is located in United Kingdom.